Ashok B. Lall Architects is a Delhi based firm committed to sustainable practice and is uniquely qualified in the design of public realm through a consultative approach. The firm with a team of transport planners, landscape designers, urban designers and community workers is spearheading the project Aapki Sadak that involves developing viable solutions for improving neighbourhood streets and reclaiming the enjoyment of public spaces. India’s rapid shifts, both internally as well as in the global market have translated into a dynamically shifting population. The shift can be seen at more than one scale including migration of large number of people from rural spaces to urban centres and the transient population that move from one centre to the other for education and work, resulting in increased densities and greater pressures on land and resources. In this transient, multicultural situation, the cohesiveness within society is gradually eroding; resulting in a more detached mind-set amongst the residents who feel less empowered to take responsibility for the public realm. What does this have to do with the design of cities? Architecture and its extension in the design of urban spaces is essentially the expression of the prevailing geographical conditions, socio-economic situation and culture prevailing at that time. Earlier cities protected with fortresses walls and shut out from invaders reflected the warring culture prevalent then. With the growth in trade and industry, the fortress walls became redundant and the focus shifted to the transport corridors snaking through the country and cites. The same mentality is evident in today’s urban cities. With an ever-shifting crowd of temporary tenants and nuclear families, replacing neighbourhoods of large families living for a generations, individual insecurities and detachment is on increase manifesting itself as gates on public streets. The areas left outside the gates are a no-man’s land. The design, implementation and maintenance of these spaces, streets, markets and parks suffer the consequence of this alienation. As a result, in the city of Delhi, it is common to see bald patches of land designated as parks that have become the abode of the homeless or dumps for garbage. Boundary walls have become urinals and the riverbank has become a deserted place that most do not have an access to. The community consists of people from different economic groups, age groups – the elderly, youth and children and gender. Its engagement and participatory design processes help inform experts, of the specific demands and needs of a particular neighbourhood. At the same time, it prepares the ground for the easy transition of the residents from the existing setup to a new one. The public attitude toward their immediate vicinity needs reorientation. Physical repair and beautification of these spaces only create a short-lived public interest and increase in use for some time. Very soon, vandalism and disuse takes over the space in question. In the face of the rapid influx of people into Delhi city, the pedestrian areas and public amenities like public transport have failed to keep pace with the needs of the growing population densities. Over the past decade, the Delhi Government has added capacity to public transport by increasing fleet of buses, testing the BRT in a section of the city and introducing the Delhi Metro. However, the number of cars on the street continues to increase every year. The demonstration project ‘Aapki Sadak’ in partnership with Shakti Sustainable Energy Foundation, technical consultants like, Oasis Designs Inc. & Sandip Gandhi Architects and through community engagement examined this trend and offered more sustainable alternatives. 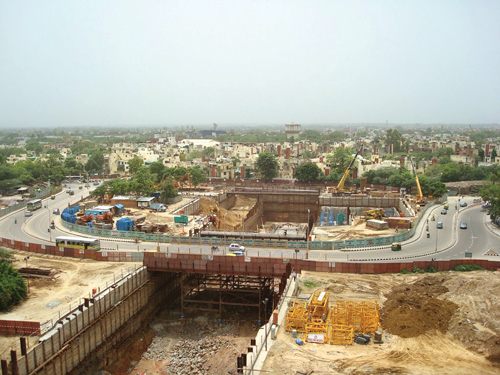 The neighbourhood in close proximity to two major public transit corridors, the Bus Rapid Transit (BRT) and the Delhi Metro was especially suited as a demonstration project because of the varied public uses and residential densities housed within a geographically small area. Challenge: Large-scale transit projects cannot successfully replace private vehicles if they do not integrate with the ‘first and last mile’. The access to the metro, bus facilities from the neighbourhoods in some places are unusable or difficult to use. This discourages people from walking to the nearby metro and encourages using private vehicle to their final destination instead. The residents listed some of the impediments encountered on their everyday commute to work, places of education, market and places of worship that are not immediately apparent to the experts and professionals. Planning Process: The project while focussing on the creation of pedestrian and Non-Motorized Transit (NMT) facilities for the people in the neighbourhood also, involved neighbourhoods in the planning process. In addition to the technical, topographical and transport surveys of existing conditions within the neighbourhood, transport user survey gave an idea of the user’s perception of the street and public space. 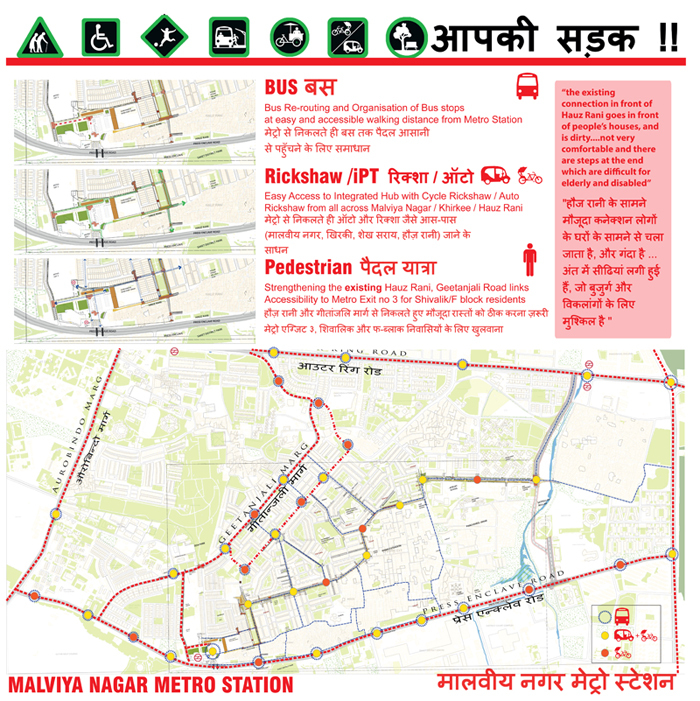 This information converted into drawings and charts was shared with the residents of the neighbourhood in workshops conducted in the open public spaces, thereby also engaging passer-by to share their experience of mobility and access in the vicinity. Design Solution: The consultative process allowed a dialogue between the planner/designer and user/resident, so that certain contentious issues such as the encroachment of streets by residents, and reconfiguration of parking etc. The design drawings accommodate the current requirements within the public space available. Each street stretch and junction called for its specific design to address the local requirement optimally. Implementation: Detailed physical survey and consultation with residents is a prerequisite for appropriate design. Community consensus also adds strength to proposals put before the authorities as was in this case as well. The South Delhi Municipal Corporation slates the ‘Aapki Sadak’ project, for implementation. However, the implementation of the project is not the end, as it’s maintenance and continued use is what will truly substantiate the consultative process and ensure that the people of the city take ownership of the public realm in the true democratic spirit. In this demonstration project, trained professionals provide the logistical and technical expertise to offer practical solutions for existing conditions through a consultative process with residents. Ar. Ashok Lall, believes that this could be a model for citizens becoming participants in the greening of the city and planning of public spaces. 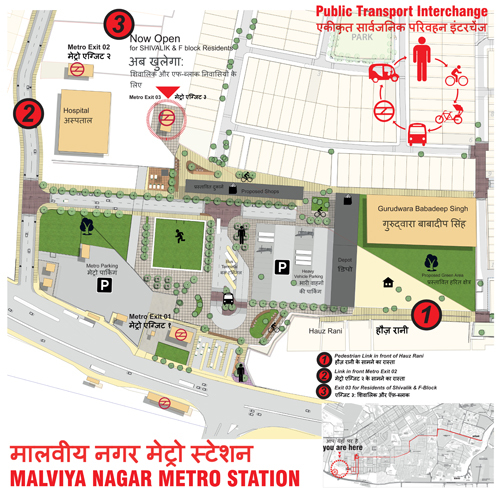 Sandeep Gandhi Architects and Oasis Designs Incorporated, who have together designed many street improvements in the country, explain that community consultation in this project has helped them find the most direct and appropriate design solutions.